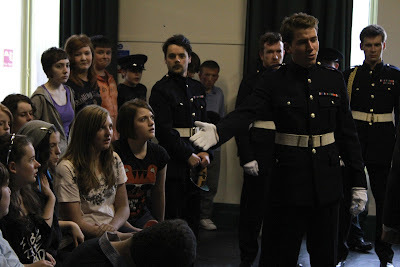 Last Friday and Saturday I set myself a fairly daunting challenge, to take our production of Much Ado out to a school and a youth theatre, deliver workshops and then do a revised, interactive one hour production of the play. The RSAMD gave me a week with the actors to develop these ideas and we had a great time working out the best way of delivering the workshops. All in the all they were a huge success and I hope that I will be have the opportunity to work with a number of the actors again at some point. I have spent the last week sitting in rehearsals with the director Guy Hollands, who has kindly agreed to be my mentor, unfortunately I couldn't make too many of the rehearsals as the roof in my flat in Largs was blown off and that has been the topic of the week really. Tomorrow I head off to the RSAMD to assist Ali De Souza in an acting masterclass, I'm really looking forward to it, I think it will be great fun. Next week I start work on Lucas Petite, a short comedy I have written both for the NTS five minute theatre and also the On The Verge Festival, I'm looking forward to directing my own show from scratch at last! Ann Marie Di Mambro has also sent me her finished script for Mere Maria, I'm really happy with it. We have a readthrough next week and already ideas are starting to form in my head about how it is going to look.